September 12, 2015, 10:36:45 AM by webmaster. The Senior Scouts are currently training for their Senior Scout Civics public service proficiency badge needed for the Grand Scout Award (same as the Queen Scout Award) this involves a great deal of research, studying and attending presentations. 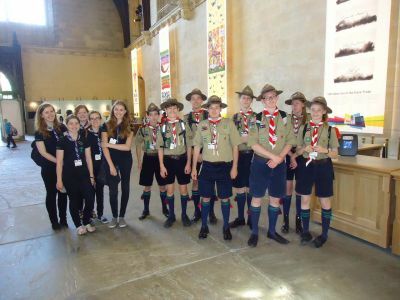 The first part involves studying the workings of Local Government at all levels, funding, voting qualifications, committees, and also the workings of the European Parliament, this was all excellently presented to them by Mr. Clive Williams, previously Chief Solicitor for Berkshire County Council that the Scouts found very interesting and enlightening. September 12, 2015, 10:10:00 AM by webmaster. As part of our fund raising towards the Scouts Uganda Expedition/Project, the Scout Group held a trial Chocolate Bingo event. Stitchy and Seb were the bingo callers and James the official referee. The evening was well supported by our Beavers, Wolf Cubs, Scouts, Senior Scouts, Rover Scouts, Scouters and parents and close family members, so well supported that all the tickets were completely sold. The hall was packed and the bingo commenced with great excitement, and soon Lines and Full Houses BINGO was called, cards checked and chocolate prizes handed out. People passing by the hall popped their head in a said what a great idea, you must do this for the village which was exactly the intention after this trial session. The excitement and fun was great, everyone thoroughly enjoyed the evening and are looking forward to the next Chocolate Bingo session and this also added a further over �200.00 toward the Uganda Expedition/Project. August 16, 2015, 12:56:31 PM by webmaster. 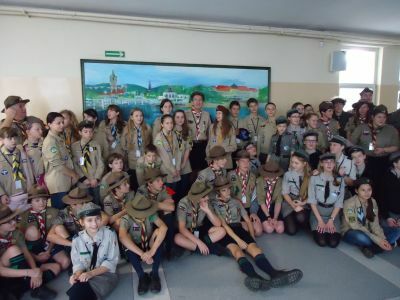 Scouts and Senior Scouts decided that they wanted to take the Scout Missioner and the Senior scout �Public Health� badges. 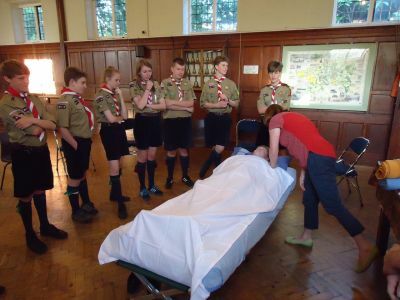 Anita Owen, one of the Senior Scout�s mother and a Registered Nurse prepared the Scouts for their badges by instructing and lecturing on the looking after the sick and bed ridden, by understanding the importance of hygiene and cleanliness, making up a sick bed and a sick room, as well as knowing how to change a bed with the patient still in it. They were also taught how to bed bath a patient, take temperature, respiration and blood pressure and understand the meaning of the readings. Also how to give medicines, prepare suitable food and how to prevent bed sores. Finally for the Scouts how to apply dressings and also roller bandages to the hand, knees and foot. August 15, 2015, 07:10:35 PM by webmaster. This year�s camp was held in Streatley Meadows (near to home) because the local Primary School were holding their Annual Summer Fete on the Saturday of the camp and they had requested that the Scouts erect an �Obstacle Course� as a fund raiser for the Scouts Uganda Expedition/Project and a draw for the Fete. Scouts always pleased to help agreed to incorporate this into their weekend camp programme. In addition because the Scouts going to Uganda would need to live for three weeks each in a small hike tent, it was decided that the camp would be a light weight camp using our high performance hike tents instead of the normal large canvas patrol tents. August 15, 2015, 05:51:50 PM by webmaster. The 2nd. Goring & Streatley Scout Group are raising funds to send some of our Scouts to Uganda in 2016 where they will be extending a school that the Scouts original built in 2010. 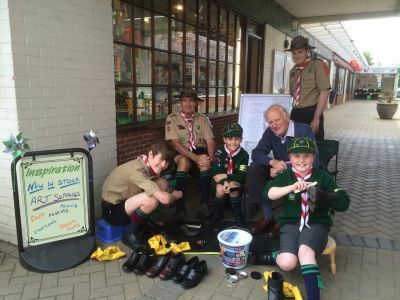 So Wolf Cub Senior Sixer Ben came up with the idea of offering a shoe polishing service in the Arcade in Goring on Saturday 30th.May, 2014. With posters posted around the village and publicity given in the GGN. At 10.00am the Wolf Cub and Scout volunteers were set up awaiting customers, and soon the bags of shoes started to arrive that customers left and returned later to collect, also individuals took the seats provided and had their shoes cleaned immediately as well as a good chat with the Wolf Cubs and Scouts. August 15, 2015, 04:55:39 PM by webmaster. 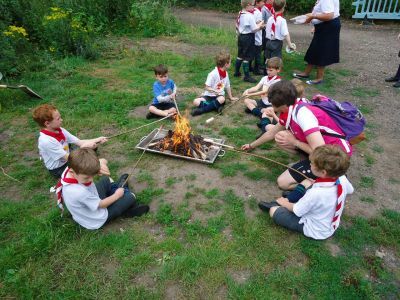 The Beavers always look forward to their sausage cook out, whilst Skip sets the fire and set light to this the Beavers are taught how to build a fire correctly, not ever to play with matches or fire, and never to light a fire without their parents� consent and being present. August 15, 2015, 02:21:27 PM by webmaster. 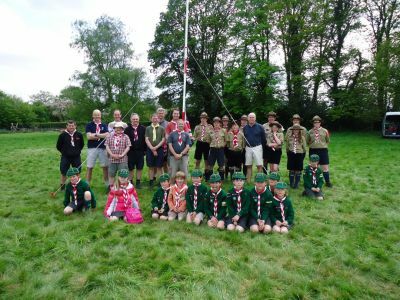 Eighteen Scouts and Scouters from our Scout Troop attended this year�s Annual Summer Camp that was held at Elmore Back, Gloucestershire near to the City of Gloucester from Saturday 25th.July to Saturday 1st. August, 2015.There were three Patrols ~ Falcon Patrol with PL William and Second James; Lion Patrol with PL Sebastian and Second Harvey; and Panther Patrol with PL Abigail and Second Molly. Skip was Camp Chief assisted by Stitchy, and Akela as Quartermaster. 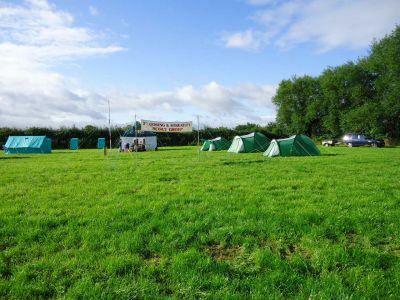 The camp site was an excellent site for our traditional Scout Troop, off the beaten track, a real rural setting near the banks of the River Severn. The farm owner kindly provided a big supply of wood that she stored in an open barn and water had to be fetched from the farm house. The camp site was a very large grass protected on all sides by high hedging. There had been very heavy rain storms on the Friday before we departed for camp that had made the camp site a little muddy but the Saturday was fine and we were able to pitch the camp in the dry, once the camping kit arrived. On the way to camp Skip�s van gear box fell apart inside, Stitchy who was driving the van had just about got the van off the main carriageway before coming to a stop, then it was waiting for the AA to transport the van to the camp site in order for the kit to be unloaded, this put us about four hours behind schedule, but the Scouts in the minibus arrived well in advance of the kit and had dug the lats before the rest of the kit arrived. On the Monday the van was collected and taken to the garage for repair, substantial repair, but was returned at 3.30pm on the Friday ready for loading to go home, thank goodness. The first couple of days were a mixture of fine warm weather and then showers, some prolonged; but the latter days were generally hot/warm sunny days with some windy spells. The final day, the Saturday was fine and sunny just what was needed for striking camp in the dry. June 21, 2015, 12:34:08 PM by webmaster. The weather started off wet on the Friday evening after we arrived at camp, but everyone was cheerful and looking forward to the camp. Then Saturday came with overcast skies and sunny periods, warm in the sun. Sunday was fine almost the whole day and very hot at times. The Scouts and parents pitched the tent on Thursday evening and set up the camp site so this was fully set up and ready for the Friday start. Skip took on the role as Camp Chief assisted by Stitchy; Akela had the harder task of being Quartermaster on job that keeps you on the go. The Scouts, Wolf Cubs and Fathers (called �Seniors� for the weekend) arrived at 6.00pm on the Friday for flag break; a warm welcome and the start of the camp; allocating the Fathers, Wolf Cubs and Scouts to their three Patrol in this camp (Lion, Wolf and Seagull - �give us your chips�) the three Patrol Leaders being Senior Scouts Jack (Lion), Abigail (Seagull) and James (Wolf); this was followed by the allocation of tents, the Fathers (Seniors) camp in Patrols the same as the Scouts, so each 14' patrol tent hold up to six Fathers. Once everyone had set out their kit in their tents and supper had been served and over; Stitchy ran a game of Manhunt whilst the rain had stopped. Then it was off to bed and a quiet night�s sleep - you have to be joking, the chattering from Wolf Cubs and Fathers went on into the early hours, and this started again in the early hours. June 21, 2015, 11:34:57 AM by webmaster. 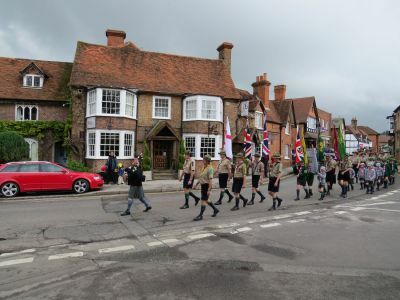 This year's St. George's Day Parade took place on Sunday 26th.April in one of the villages of the Grand Scout Master, the Reverend Michael Foster, the village of Tarrant Keyneston. The 1st. Wessex as is their custom camped for the weekend just on the outskirts of the village and were blessed with good weather despite being a cold wind blowing at times. The 2nd. Goring & Streatley travelled down by coach on the Sunday and arriving just before the parade was due to march off. February 15, 2015, 03:24:50 PM by webmaster. 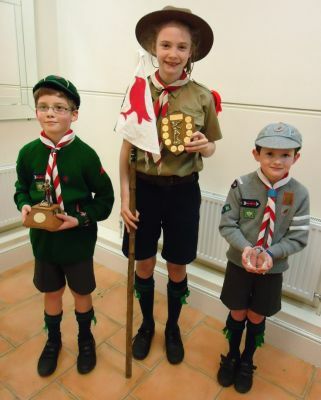 For Year 2014 the 'Scout of the Year' was awarded to Scout Ciara from Streatley who gained most points throughout the year for her support at Scouting events and activities; attending regularly at Scout Troop meetings; the monthly Church Parades; camps; hikes and raising considerable funds for the Scout Group through 'Bob-A-Job' and other fund raising activities; and for generally setting an excellent Scout standard for the other Scouts to follow within the Scout Troop. Ciara Scored 100 points, followed closely by PS Sebastian Avery from Goring with 96 points and in third position PL Abigail from Calcot with 86 points. February 15, 2015, 02:33:28 PM by webmaster. 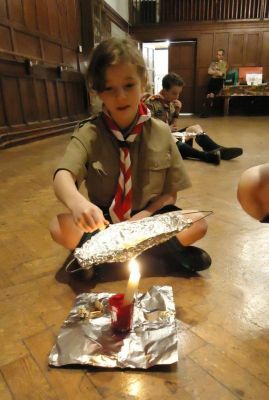 Scouts were each provided with kitchen foil, metal coat hanger, candle, very small amount of cooking oil and a quail egg (as these are small and cook very quickly). All the Scouts successfully cooked their eggs without breaking their yokes and all were consumed far more quickly. The quail eggs were so scrumptious that the Scouts asked for more. 'More!' Skip roared in true Dickensian style. February 15, 2015, 02:01:20 PM by webmaster. 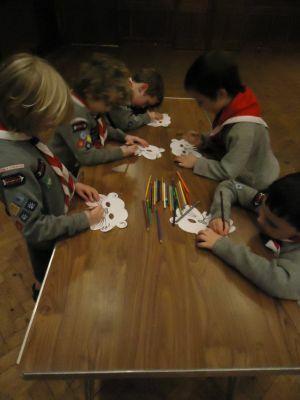 As part of the 'Helpful Beaver' badge, the Beavers were told that they had to imagine that it was their parents' Wedding Anniversary or maybe a special event that they wished their parents to celebrate, so they had to imagine that they had cooked a very special meal and now had to set the table properly for their parents to enjoy the meal. 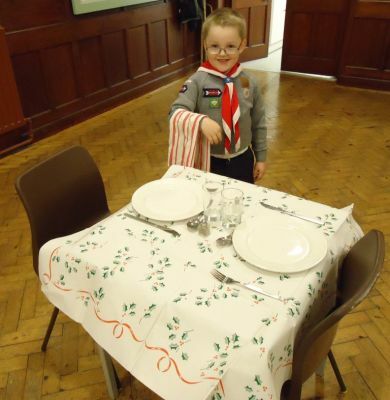 The Beavers placed a table cloth on the tables and then all correctly set out the cutlery, plates, condiments and plates, what a good job they made of this and of course all passed this part of the badge test. December 13, 2014, 05:56:01 PM by webmaster. 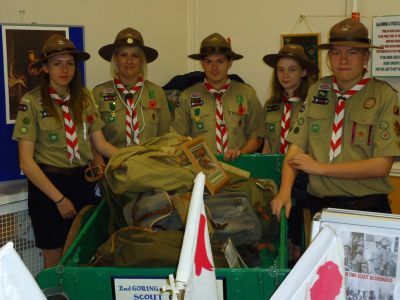 Scouts and Wolf Cubs from our Scout Group were invited to take part in a World War One Exhibition held in the local village hall. It was considered that Scouts should be included because they played a very important part in the First World War, having been volunteered to assist were required, unlike the Boys Brigade whose leaders apparently would not give permission for its membership to assist. 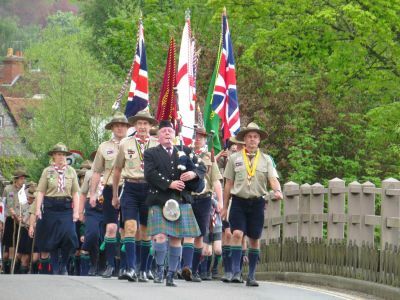 The duties of the Scouts, both boys and girls, bearing in mind that the British boy Scouts & British Girls Scouts were founded in 1909 and therefore the Girl Scouts played an equal role as the Boy Scouts, but there were less of them, was very wide spread non-military roles from running messages for the Armed Forces and War Office, Police, Railway Companies and the Post Office; along with many other Civil Defence duties such as guarding railway stations, bridges, railway lines, telephone lines, coastguard duties etc against spies and saboteurs; also helping in hospitals, collecting waste paper, card and scrap metal for recycling and organised growing of vegetables and catching rabbits, helping on farms because with such a shortage of manpower there were no others to do these tasks and too keep the country safe and in food. December 13, 2014, 05:32:25 PM by webmaster. Skip (David Cooksley) felt very privilege and proud to be able to announce that five of our Scouts had gained their 'Scout Cord' they were PL Oscar, PL Abigail, PS Robbie, PS Sebastian and PS William all now 15 years of age or almost, the highest award for a Scout involving passing many progressive tests and gaining many badges in order to make them a worthy holder of this award, so very well done to all five. December 13, 2014, 05:01:14 PM by webmaster. 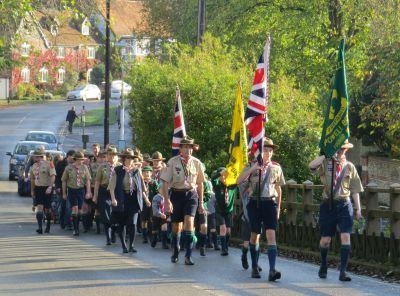 A good turnout by our Scout Group on Sunday for the Remembrance Day Parade. The Scouts, Senior Scouts, Wolf Cubs and Beavers looked so smart and helped to maintain our image as the smart uniformed Scout Group image. The British Legion representatives, the Vicar leading the service and the congregation all complimented the Scout Group on their smartness and their excellent behaviour throughout the Service. November 30, 2014, 09:23:57 PM by webmaster. 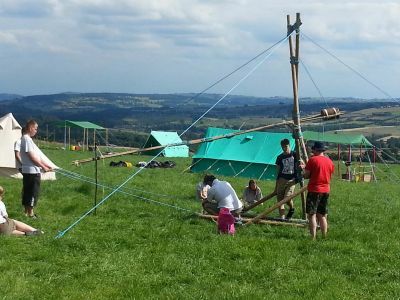 Seventeen Scouts and Scouters from our Scout Troop attended this year�s Annual Summer Camp that was held on The Manor Farm, Little Longstone, Derbyshire. 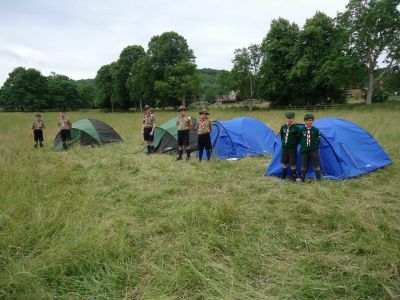 The camp site was an excellent site for our traditional Scout Troop, off of a track between two villages but hardly used with excellent panoramic views across the Derbyshire Peaks and the Monsal Valley. There was a wooded area on the other side of the track that we could use for collecting firewood, pioneering, backwoodsmanship and games. The camp was situated on a very large grass meadow/ field and we were situated at the top part with some shelter from a large dense hedge to the rear of the camp site, the camp site could be seen from miles around and looked very impressive as the photographs clearly shows. We were blessed with hot/warm sunny days for the week apart from the Friday afternoon when we had rain that lasted right into the evening, the evening of the Camp Fire (but that did not stop the Camp Fire being held). Then on the Saturday morning the rain was almost continuous during the striking of the camp, even a clap or two of thunder and lightning ~ �but we laugh at the weather�. But it did mean that we had to re-pitch the tents on our return to dry these out, luckily now with warm sunshine and a breeze the tents were dry within the hour and able to be returned to the QM store. Having left Goring Station at 8.10am on the Saturday we arrived at Little Longstone at 12.30noon and sat for a while having lunch. Then it was on with establishing the camp, digging the �bogs�, sorting out the supplies, kits in the tents and laid out. Then off exploring the rest of the camp site, collecting wood for the fires and drinking water from the farm about a mile away. Everyone had a great night sleep after the travelling and labours of the first day. Then it was up early on the Sunday morning, breakfast, wash, change into uniform ready for flag break and inspection before leaving to attended Chesterfield Church (with the famous twisted spire) for the morning Church Parade, the church gave the Scouts a very warm welcome and praised them for their smartness and participation in the Service, we were told by the new Vicar that we must camp nearby again next year. At end of the Service the Scouts collected their flags and then formed a Guard of Honour outside the church for the congregation to pass through that was very much appreciated. The Church Warden then gave the Scouts a very interesting guided tour of the famous twisted spire climbing up through the structure, and also going onto the spire outside balcony giving an excellent birds-eye-view of Chesterfield, they were even permitted to ring the bells. 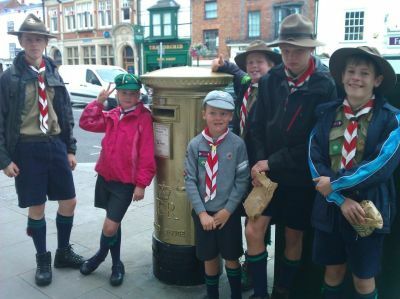 After lunch the Scouts were free to explore the town of Chesterfield before heading back to camp. November 28, 2014, 07:19:21 PM by webmaster. The Scouts joined up with the 1st. 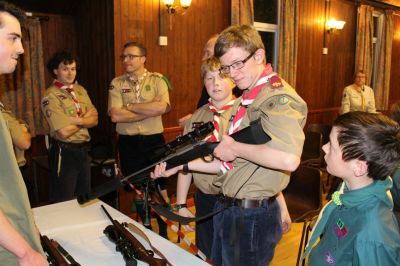 Woolhampton SA Scout Troop for a joint meeting on the 1st.April, 2014 to be instructed on gun handling and gun safety in advance of their undertaking of the Scout 'Marksman' badge. Scouter Midships, dressed in his traditional plus fours hunting gear, gave the instruction on the gun safety. He displayed his large collection of guns, single barrel and double barrel, air guns and shot guns, one shotgun dating back to the 1840s and still in use. The ammunition used for each gun was displayed and again the safety precautions needed when handling. October 25, 2014, 06:05:08 PM by webmaster. 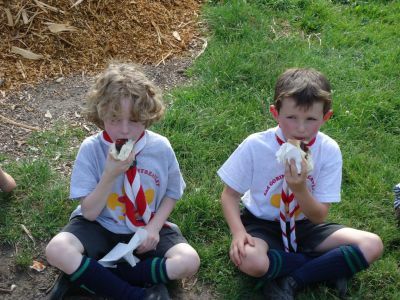 As part of the Active Beaver Badge, the Beavers had to cut down a thin stick and debark the end sufficient to slide a sausage on the stick. 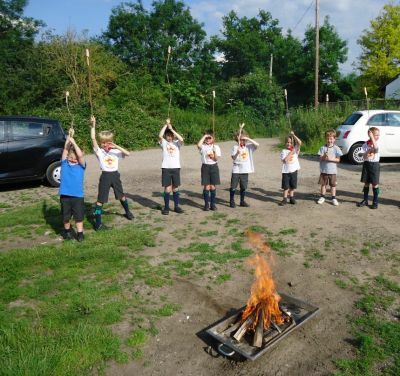 With sticks and sausages ready, Skip and Senior Scout Patrol Leaders demonstrated to the Beavers how to correctly prepare a fire and light it, whilst also reminding them of the dangers of playing with matches and fires. October 25, 2014, 05:54:44 PM by webmaster. One of the projects for the Beavers to make in order to pass their tests was making a 'Beaver Twirly' the type of toy that their grandfather and great grandfather would have made and played with, the Beavers had great fun making these and playing with them afterwards. 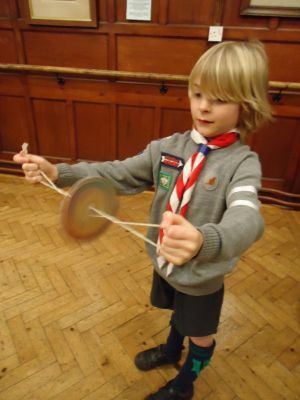 All the Beavers' twirlies worked very well as the photograph of Lodge Leader Leo displays. May 01, 2014, 08:04:13 PM by webmaster. 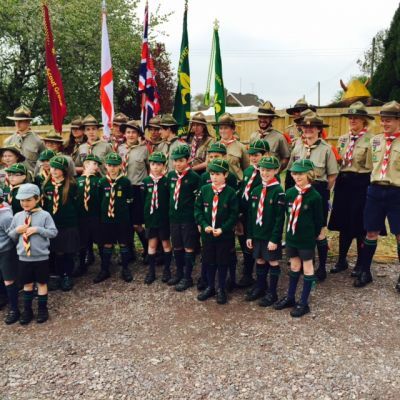 This year�s Association�s St. George�s Day Weekend Camp took place in Streatley-on-Thames, Berkshire. Despite the very wet start we pitched the camp and got on with the planned weekend activities, and blessed with good weather for the remainder of the weekend. 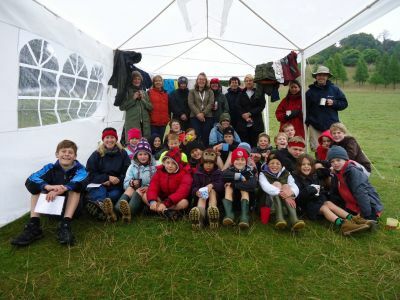 The 40 plus Scouts, Senior Scouts, Wolf Cubs and Scouters, with Stitchy as camp chief for 2nd Goring and Streatley, took part in a geocaching exercise on the Saturday morning. In the afternoon there were games and a Semaphore Flag signalling competition. 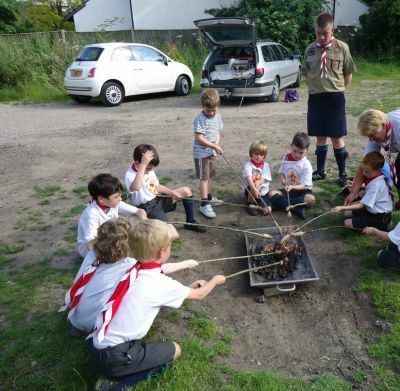 In the evening the villages� residents were invited to a fantastic traditional Scout Camp Fire, it was well attended and all were given burgers or hot dogs after. 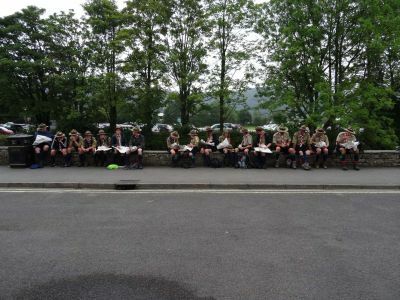 The camp was visited by lots of local residents out walking who complemented the Scouts on their camping standards and general organisation, �traditional Scout camping at its best� one commented. December 22, 2013, 04:58:22 PM by webmaster. Twenty-one Boy and Girl Scouts from our Scout Group and other BBS Scouts from the UK, who joined with over 100 Boy and Girl Scouts from Poland and the Ukraine, took part in the Order of World Scouts (OWS) Christian Scout �Get Together� in the beautiful seaside resort of Sopot, Poland, over the extended weekend of the 14th to 17th of November, 2013. One contingent of our Scouts travelled on the Thursday 14th from Luton Airport and the second contingent were due to flight out from Stanstead Airport on Friday 15th. 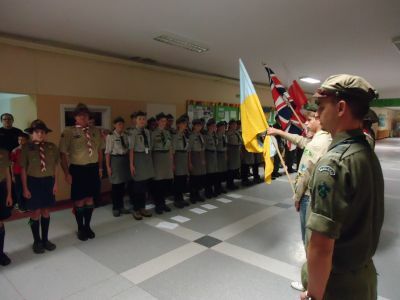 The first contingent, which arrived on time at Gdansk airport, were taken to different Polish Scout�s homes where they spent the first night as guests of the families and were so well looked after. 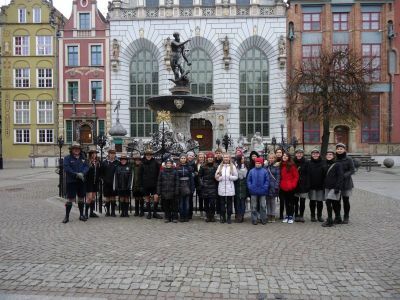 Then on the Friday, whilst awaiting the arrival of all the other Scouts, were given a guided tour of the beautiful old town of Gdansk, also the modern parts around the Solidarity Museum, even saw a fragment of the Berlin Wall, and many other parts of great interest. It was heard of the extreme suffering that the Polish had to endure under the Germans and later under the so called liberating Russians. The Scouts really understood and were clearly very appreciative of the freedom we have in this country. It was told that the war time Polish Scouts, whilst not shouldering arms, acted as spies reporting enemy positions and activities and many were shot as spies. The large memorial with the Scouts� names who had been shot by the Germans, but held up as heroes in Poland was later seen. November 13, 2013, 07:51:28 PM by webmaster. 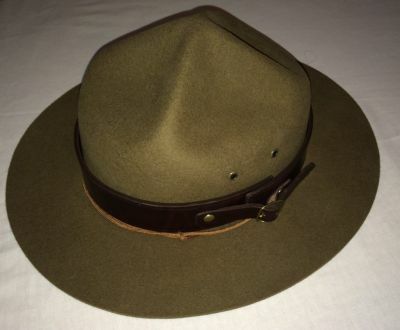 Scout hats have the traditional narrow leather hat belts with Scouter hats the traditional wide leather hat belts. November 03, 2013, 10:06:26 PM by webmaster. The weather forecast leading up to the camp predicted storms with high winds and torrential rain, but that would not deter us - �we laugh at the weather�. So Thursday evening came and the time to set up camp, it was a beautiful evening but unfortunately few turned up to help set up the camp. Consequently not all the tents needed for the camp for the 40 Mums, Wolf Cubs, Scouts and Senior Scouts were pitched (definitely a rota needed for the next camp). Needless to say, Friday night it rained quite considerably. We had to fight to get all the tents pitched before it was dark, so some tents were not pitched to our usual required high standards. The rain and wind continued through the night, and some tents because they were not pitched well allowed rain to come in onto the groundsheets, so as well as campers being wet so was some of their kit. Saturday morning came and it was drizzling on and off; more on than off. Some of the Mums and Wolf Cubs kit were found to be wet and coats also soaked, but it appeared to be brightening up. Alas, after great consideration, it was decided that the Mums wished to call it time, along with some of the Wolf Cubs. Some Wolf Cubs wanted to stay on but their kit were wet and so were very disappointed that they had to leave; one Wolf Cub Molly did stay as she had shared the Girl Scouts tent and her kit was dry and two Mum also stayed. October 20, 2013, 09:20:14 PM by webmaster. Our new scouting friend from the 1st. 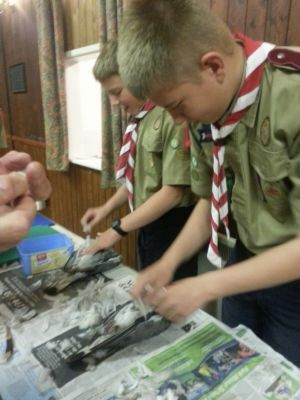 Woolhampton Scout Troop invited our Scout Troop to their meeting hall for a joint Scout meeting. After a team game where the Scouts from both troops were mixed, the Scout were directed to various work station spread around the hall, these included tree recognition from leaves and branches; foods that grow wild in the woods and how these can be prepared to eat or use in a useful way for the backwoodsman; knife and axe sharpening and generally how you should look after these and use them; and finally, the Scouts were given pigeons to pluck, skin and remove the breasts, the only edible part of the pigeon, that was then cooked and eaten by the Scouts, who agreed that it was very tasty. September 18, 2013, 08:55:57 PM by webmaster.